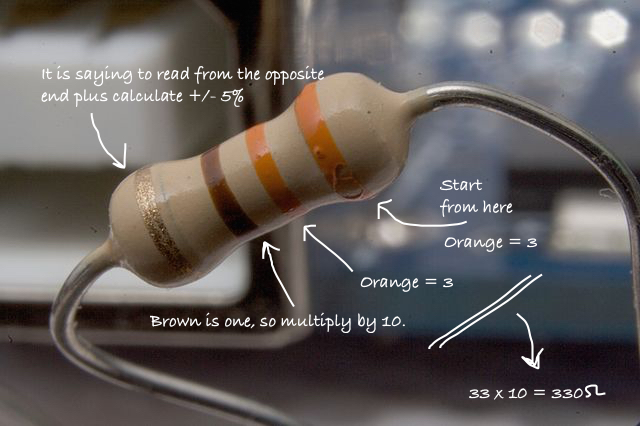 Here is How To Measure Resistor With Multimeter & Color Coding To Cross Verify For Using in Circuit and DIY Electronics Works in Easy Steps. We have a basic article on breadboard power supply. After power supply, the next major important thing to learn is how to measure resistor with multimeter and color coding. There are bands painted on the resisters, that is basically for indicating their resistance. A multimeter is a very important tool and we highly suggest to buy even a very cheap multimeter. We are talking about through-hole, axial-lead resistors. Black (0) has no energy, brown (1) has a little more, white (9) has every color and grey (8) is like white. For red (2), orange (3), yellow (4), green (5), blue (6), violet (7) part, there is kind of rhyme. Too/Two Red is Three Orange which has Four Yellow Five Green Leaves with Six Blue Seven Violet Flowers. When we are saying Three as Multiplier, then it is 1 000. It is hard to remember the numbers against the digits by a non-electrical, non-electronics person who otherwise read the Ohms Law. Plus a color blind can not see them. We suggest to read the value from color coding first. Then we can use a multimeter to get near about the right value. We are talking about digital multimeter’s reading. Plugs on Multimeter – there are usually two holes for the probes. 10A marked hole will not be used for this purpose. Use the remaining two. Dial on Multimeter – move the dial to any of the suitable closer value, values starts from 200Î© and ends at 2MÎ©. As because the resistors are of 5% difference in production, the resistor values are 5% apart. Read approximate value from color coding or set to a medium value. Hold two probes against the resistor’s two legs on a flat non-conductive surface. If the reading comes in decimal like 0.19, then you can move the dial of multimeter to the next lowest value written on the multimeter. It will become like 187. It is very difficult to measure the resistor on circuit. The multimeter sources a small constant current and measures the voltage between the two probes using Ohm™s Law. If the current sourced by the multimeter goes through only one resistor, we can read the value of the resistor. But in a complex circuit, the current will flow everywhere, not just through the resistor of interest. You can try by putting two new 10KÎ© resistors in parallel on a flat surface. Then you’ll put the multimeter probes on both ends. The multimeter will read 5KÎ© “ the equivalent resistance of two 10KÎ© resistors in parallel. These multimeters are not exactly for measuring resistor on circuit. Desoldering is possibly the right method as there is some suspected error. Else you need to use the complex formula for parallel and series resisters. You can see the color code, is not it? Defective resister is rare. Actually a Wheatstone bridge is better for complex circuit as we need precise measurement. This Article Has Been Shared 3659 Times! Processor Technologies can accelerate the processing speed of a processor not only by increasing the clock rate. Learn how it works in the background. Symmetric Multiprocessing System is a multi-processor based Architecture where there are two or more identical processors with a shared address space. Cite this article as: Abhishek Ghosh, "How To Measure Resistor With Multimeter & Color Coding," in The Customize Windows, July 21, 2015, April 21, 2019, https://thecustomizewindows.com/2015/07/how-to-measure-resistor-with-multimeter-color-coding/.